Summary: A new Nature Communications study reveals increased calcium levels in brain cells may play a significant role in the development of Parkinson’s disease. Funding: The research was funded in part by the Wellcome Trust, the Medical Research Council, Alzheimer’s Research UK, and the Engineering and Physical Sciences Research Council. Image Source: NeuroscienceNews.com image is credited to Janin Lautenschläger. 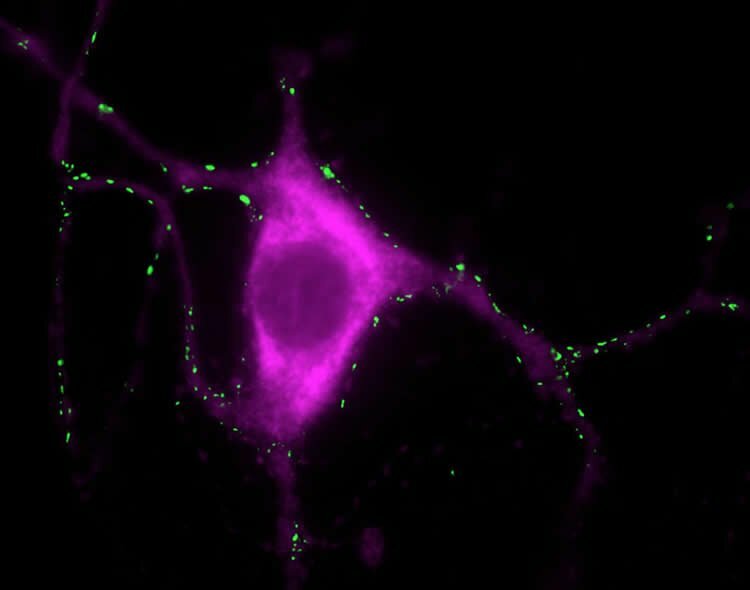 University of Cambridge “Calcium May Play a Role in the Development of Parkinson’s.” NeuroscienceNews. NeuroscienceNews, 19 February 2018. Alpha-synuclein is known to bind to small unilamellar vesicles (SUVs) via its N terminus, which forms an amphipathic alpha-helix upon membrane interaction. Here we show that calcium binds to the C terminus of alpha-synuclein, therewith increasing its lipid-binding capacity. Using CEST-NMR, we reveal that alpha-synuclein interacts with isolated synaptic vesicles with two regions, the N terminus, already known from studies on SUVs, and additionally via its C terminus, which is regulated by the binding of calcium. Indeed, dSTORM on synaptosomes shows that calcium mediates the localization of alpha-synuclein at the pre-synaptic terminal, and an imbalance in calcium or alpha-synuclein can cause synaptic vesicle clustering, as seen ex vivo and in vitro. This study provides a new view on the binding of alpha-synuclein to synaptic vesicles, which might also affect our understanding of synucleinopathies.